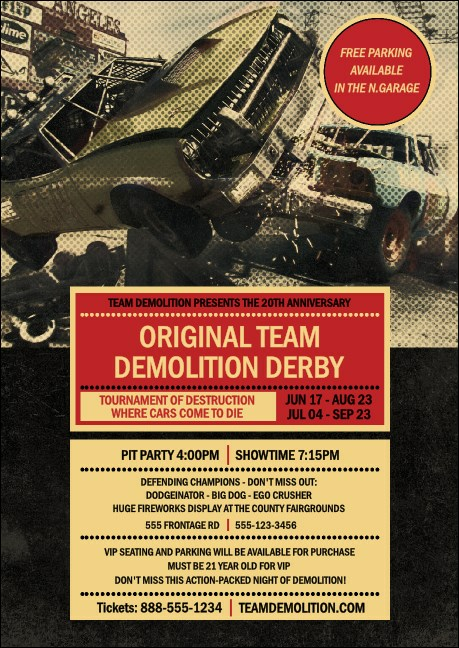 Loud, fun, exciting…communicate your upcoming event’s energy and information with the Demolition Derby Postcard Mailer. Cars collide behind red and yellow color blocking, atop which your tournament’s details blast to the forefront. Team with VIP passes, event tickets, parking passes, and more from this compelling design’s matching event kit. Engage your event’s audience and sell more tickets with TicketPrinting.com postcard mailers.